Threshold ramps are an effective way to eliminate dangerous trip hazards created in our homes by doorway thresholds and floor elevation changes. 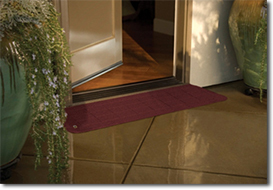 By removing these home hazards with our threshold ramp products our customers defend themselves against losses in personal mobility and or costly medical bills due to falls. We have a broad offering of threshold ramp products to fit all your needs and budgets. Each product is designed for safety, strength, and durability. To learn more simply click on BUY NOW. 2019 Aging In My Place. All rights reserved.